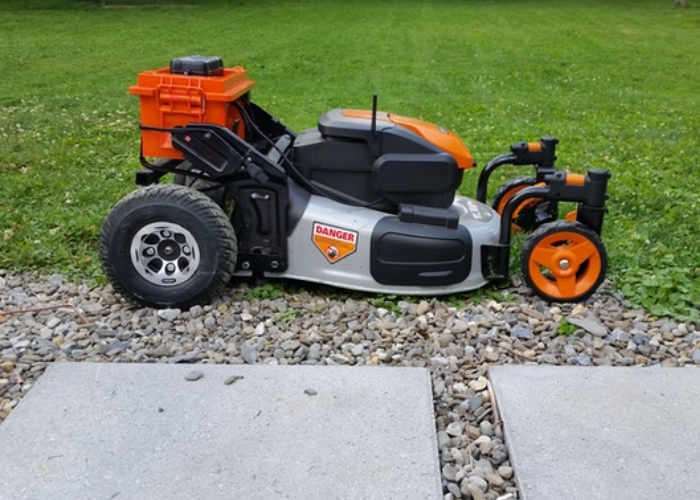 If you too hate cutting your lawn, you may be interested in a new remote control lawnmower called the TigerBot, which is sure to bring back a little more excitement to the mundane task. Designed by Tim Kushner the TigerBot remote control lawnmower allows you to cut your lawn from your favourite chair and is powered by a 24 volt 30 amp hour battery. Watch the demonstration video below to learn more about its design and features. • 1 x 24 volt 30 amp hour driver battery with the integrated intelligent battery charger. • 2 x 56V batteries for a total of 18,000 sq Feet per charge. TheTigerbot is a Remote Control mulching (or side discharge) mower built from a Worx 56v cordless mower. The mower and drive system are powered independently. The drive system is powered by a 24 volt 30 amp hour battery. The drive system has an integrated battery tender that charges and maintains the batteries for optimum performances and life. Simply plug in the standard AC cord (included) and press the charge switch. The battery charger prevents overcharging, so it can be left plugged in until it’s ready to use. The drive is totally disabled during charging. The lawn mower portion uses a Worx 56v battery to power the blade motor.Two are included with the TigerBot Core. You only need one to power the mower in ECO mode. Which allows for longer runtime. Or you can use them both at the same time for HiGH-performance mode. High performance is better for high grass. The mower batteries are charged using the included Worx charger.